Washington DC (Ali Imran) The trigger for Director/Producer Noor Naghmi’s newest film was not just the post-9/11 anti-Muslim environment in the United States or even inflammatory 2016 election campaign rhetoric, but the stark distortion and lack of representation of America’s reality of tolerance and coexistence. 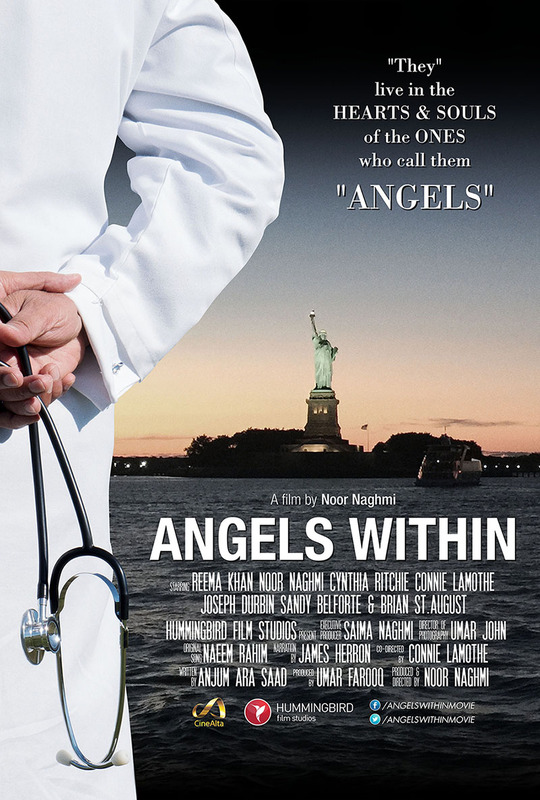 The focus of Naghmi’s newest film, Angels Within, is the large community of Pakistani-American doctors who spend their lives providing healthcare to Americans in remote towns across the country – places which do not offer lucrative returns and hence are not a major attraction for many other Americans in the medical field. Angels Within is an attempt to tell Americans the collective story of physicians who come from half a world away and, instead of making big bucks in U.S. megacities, mix with Americans in places where the majority of the population likely has never heard of the doctors’ country of origin. “They are the angels within American society. Each one of the Pakistani-American doctors has a story to tell. This is a story of hard work, dedication, and service,” he says. Of course, like everyone else, doctors who immigrate and adopt the United States as their homeland do receive financial returns for their service. “But it is much more than that. It is opting to go to far-off places where others rarely reach. I remember an Iowa lawmaker saying that if Pakistani-American doctors were taken out, the healthcare system in the state would collapse,” Naghmi said in an interview. He also cites the example of a doctor in a rural town in Minnesota, whose story of reaching out to fellow Americans, as told in The Washington Post this month (July 2017), gained a lot of attention, underscoring the role of immigrants and the idea of peaceful coexistence. “While there are challenges, I also met a lot of Americans who acknowledge and praise the contributions of immigrants. “At the same time, I felt a strong need to tell my fellow Americans the amazing work the Pakistani-American doctors are quietly doing,” says Naghmi, whose country of origin, Pakistan, is one of the biggest suppliers of trained medical practitioners to the United States. The theme of the film, which will soon be exhibited at festivals, addresses the broader question of stereotypes and generalizations of Muslims by some media outlets and organizations that paint the entire Muslim communities with one broad brush whenever an act of violent extremism takes place. “This discriminatory representation is absolutely against American ideals of liberty and equality,” he says, citing movies such as Enemy Within and Siege. Angels Within has a true story, with a larger unfolding tale that includes stories of individual doctors, which the producers hope will interest all Americans, not just those from diverse communities. The story, written by a young writer, Anjum Saad, is another effort at using arts as a platform for dialogue between American Muslims and mainstream America. In a welcome sign, several American Muslims have recently taken to comedy, entertainment, and films to engage with Americans of all political persuasions – with a lot of encouraging responses. Together with interfaith dialogue, such conversations can help address harmful generalizations regarding diverse communities such as American Muslims, who are contributing to America’s progress in so many areas of national life.